Sonic the Hedgehog 52 is the fifty-second issue of the Sonic the Hedgehog comic. This comic features two stories: "The Discovery Zone" and "First Contact". The scene is replaced by a 1940s-themed dance club, a place where people can go and not worry about the tyranny of Dr. Robotnik. Sonic the Hedgehog, dressed in that same floating suit and fedora, sits at a table with a soda, waiting for his guest to arrive, of which he was told they 'won't be missed' via a phone call. Surely enough, a dazzling woman enters the club attracting the attention of all the men. She approaches Sonic's table, as the wives of the men gawking at her get quite angry. Sonic gets quite intrigued as the woman approaches his table. Indeed, she pulls a seat up, introducing herself as Ms. Acorn, asking if his name is Sonic. He tells her so, as she mentions that she made the phone call earlier. With introductions out of the way, Ms. Acorn tells Sonic that she knows of someone who could get rid of Doctor Robotnik. In a suave way, Sonic tells her to continue, so she offers her price, rubbing his arm, asking that all he does is return her friend NICOLE, thus giving him a juicy reward. She kisses him, instantly making Sonic accept the job. Ms. Acorn tells him the last location she saw NICOLE, the west side of the city. In no time, Sonic zips out of the club to start his mission, knocking everybody off guard by surprise. While running through the city to get to a factory on the west side of the city, Sonic takes out his watch communicator to contact his informant Uncle Chuck. He asks him to bring up any information he has on the Slippy Dippy Slide Factory from his computer, which Uncle Chuck is more than happy to do. After some time, Sonic arrives at the factory, just as Uncle Chuck recontacts him. He has found out that the factory has not been under control of Robotnik for some time. With that information on hand, Sonic runs up the building side and finds an entrance from the top. He jumps in to find the factory room pretty empty, apart from lots of misplaced slides and junk, obviously damaged by somebody. He then notices a black mark on the floor. He picks some of it up with his finger, noticing that it is oil, but not just any oil; robot oil. Taking out his watch again, Sonic asks Uncle Chuck to scan the area for any robots. While waiting for Uncle Chuck to do his work, Sonic begins to wonder what NICOLE knows, especially since Robotnik is now involved. After finding out some information, Uncle Chuck has determined that there are four robots nearby, which he displays on Sonic's watch. He rushes out of the factory to investigate. Sonic catches up to the robots, who are flying to return to Robotnik's control zone. Not wanting them to return, he gets into action, jumping at the robots and using his spindash to easily take one of the robots out. The others take notice, so Sonic grabs a power ring from his suit and throws it at them, cutting the other robots in half. However, one of the robots has escaped the battle, but Sonic hasn't forgot about it. He dashes after it, noticing it is holding onto something important. He hops on the robot's back and grabs the small computer-object from the robot's grasp, distracting it as it tries to grab the object back from Sonic. With his objective complete, Sonic hops off the robot, as it crashes into a nearby building. Once Sonic reaches the ground, he opens the hand-held computer, which introduces itself as NICOLE. It then tells Sonic that it is low on power and must be returned to Ms. Sally. He decides to do so, but while running back to the club, wants to know what Ms. Sally has gotten him into. Back in the club, Sally remains concerned over the state of NICOLE, and Sonic somewhat, despite the cheery mood of the establishment. Sonic eventually arrives, to Sally's joy, handing NICOLE over. Noticing the computer is low on power, Sally puts a new battery in, bring NICOLE back to full power. Before the duo can continue, they hear an ominous voice from behind...Dr. Robotnik, who has arrived at the club. The dictator, with his squad of combots, tells Sonic that he is actually working not with Ms. Acorn, but Princess Sally Acorn, leader of the rebellion against him. NICOLE has plans to all his research stations, so he wishes to have it back to destroy the information. Sonic is curious to know when Sally would tell him that she is leader of the rebellion, but with a dire situation at hand, they decide to argue about it later. Sonic jumps into action, slicing a number of combots in half to Robotnik's surprise, also scaring the club-goers, who run to cover. However, Sally, being left alone, is surrounded by the remaining combots, who point their weapons at her. Sonic stops, not wanting to risk the princess' life, forcing her to apologize for bringing Sonic into this mess. She explains that she didn't explain her true nature because she suspected he wouldn't have accepted the mission in such a case. She further tells how she downloaded the plans to Robotnik's factories from the slide factory, but a number of his robots arrived, so she had to make a quick escape. She climbed through the nearest open window, but dropped NICOLE back inside accidentally. Not wanting to risk getting caught, she left NICOLE behind and hoped Sonic could do the job. Another combot prepares to jump on Sonic, making Robotnik tell him that he is done. Sonic, on the other hand, has an idea. He takes out the power ring from his suit pocket, conjuring up enough speed to escape the combot, and grab Sally before the robots can react. Robotnik orders his robots to stop him, but his speed is too much for them, allowing them to escape the club. The doctor points at the door, telling his minions to get them. Despite winning that round, Robotnik declares that he will win the next. In the club, under a table, Sonic and Sally look out. Sonic, using his speed, tricked Robotnik into thinking he left the club, when he and Sally actually hid under a table. Once the coast is clear, the two leave their cover to begin the next part of their impromptu planning. Sonic takes out his watch and contacts Uncle Chuck to get a plane ready for Sally to return to her rebellion. Uncle Chuck is able to do so, telling him that he'll have a plane ready, piloted by Rotor and Tails. Sally is still concerned, as she believes there is no way they can get to the airport with Robotnik's troops around. Sonic already has that planned, as he lifts a nearby bar table up, revealing a hidden staircase leading to a pathway to the airport. Back on Mobius, at the cave, Sonic emerges with a power ring in hand, when the Freedom Fighters just arrive after word from Tails. Sonic is confused about everything, as the group ask what happened, especially since Tails told them the weird story about the floating suit. He tries to explain, but the whole ordeal he went through confuses him, explaining that he was fighting Robotnik. The others become as confused as he is, thinking he ate too many chili dogs. Sally is doing lots of work on NICOLE, walking by Bunnie Rabbot and the other Freedom Fighters. They say hi to her, but she walks by ignoring them. They don't take offence to this, thinking that the events of the past week are keeping her busy. She arrives at a metallic door, using NICOLE to enter a code to enter it. The room is highly computerized, with a command chair and a large computer console in the middle. She sits in the command chair and puts NICOLE on the console, who asks what Sally is doing. Working on the console, she explains that, using NICOLE's broadcasting system, she's going to uplink to one of Robotnik's satellites to communicate with the other Freedom Fighter sects around the planet. The broadcasting system works, as Sally is able to contact 8 Freedom Fighter sects located around Mobius, including the Chaotix, the Arctic Freedom Fighters and the Wolf Pack Freedom Fighters, among others. The communication link works perfectly, so Sally begins by stating that they are in a dire situation. She updates everybody on the events of the past week, regarding the how Robotnik got an impostor in place of the King, and almost succeeded in framing Sonic for her near-death experience. Sonic and Knuckles, with Geoffrey St. John, were able to liberate Knothole Village. Sonic then focused on Robotnik, where his Ultimate Annihilator backfired on him, killing him and nobody else. Sally then tells how she woke up from her coma, Sonic was declared a hero, and her father has started to regain his conscious state. They now wish to enter Robotropolis the next day to determine the full extent of the damage done to their former capital. Unfortunately, despite this good news, she has some bad news. Despite Robotnik being destroyed by his own creation, the malfunctioned Annihilator also created some side effects, opening different zones around Mobius in the process, in essence, alternate realities. Sonic's experience earlier with the floating suit was a result of such an alternate reality, and Knothole now exists 3 hours in the future. Due to this, the only way in and out of the village is through their oak slide. She tells the sects to watch out for these zones, but before she can finish, the transmission ends. Unable to reestablish the link, she shuts down the console and leaves with NICOLE, hoping she gave them enough information to stay clear of the zones. Continued in Sonic Super Special 2. This is the first issue of the main Archie Sonic series to be written by Tom Rolston. 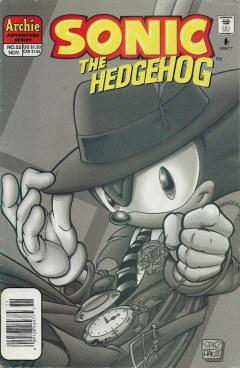 The very first issue in the series, as a whole, was the Sonic Super Special 1. Although the art in this issue has been developed by artists who have worked on the comic before, the art style in this issue is considerably different than past issues. This could likely be due to the 'old' style required for the story. The ending of The Discovery Zone is based off of the 1942 classic film Casablanca. The robots Sonic fight are based off of those from Mystery Science Theatre 3000. One of the Freedom Fighter sects Sally contacts has a mongoose representative. This Freedom Fighter would later be used to develop the character of Mina Mongoose, both of which have similar designs.